We had a super epic offshore trip on this wonderful Wednesday morning. 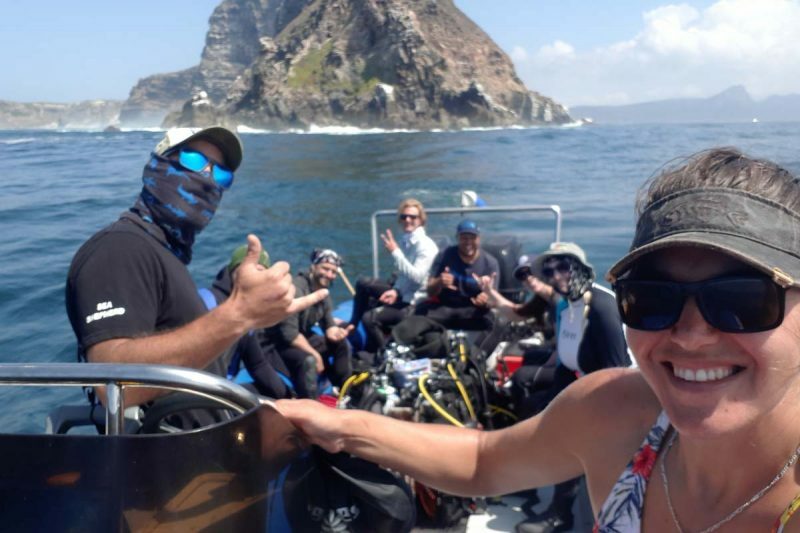 The weather was absolutely beautiful and we had a stack of divers that wanted to go see some blue and mako sharks. We had two boats that went offshore on this gorgeous weather day, our 30foot dive boat “Shark Explorer” and our 24foot/8metre Super duck/Rib “Explorer 2”. The fun loving German group on Shark Explorer went out a little earlier in the morning to get a head start in finding the sharks. Captain Stef and his crew Jess and Ernest worked extremely hard in trying to find the sharks in the deep blue. Sometimes when the weather is too beautiful it works against us with regards to covering more ground out there in finding sharks. Very few times in a year, possibly even twice a year, do we have zero wind and no swell offshore. The ocean was like a sheet of glass even though we were 30kilometres off Cape Point in open ocean. However with effort , knowledge, experience and expertise in this offshore environment we had a little tactical change of plan and managed to find 3 different blue sharks and 2 makos !!!! Sometimes the sharks arrive in 3 minutes sometimes they arrive in 3 hours but something that we stand by as a team is, the never give up policy. 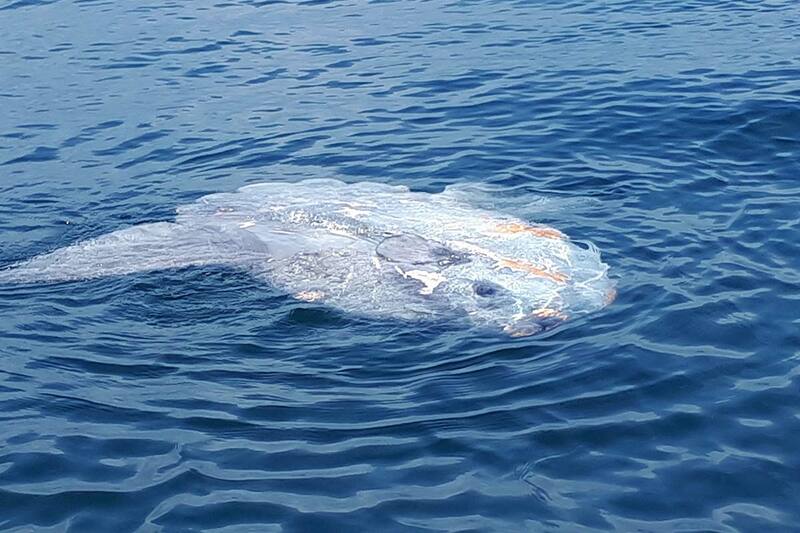 The group on Explorer 2 were fortunate enough as well on the travel out to witness and photograph an enormous Mola Mola/ Sun fish. Both groups of divers had awesome interactions with 2 large Blue Sharks and a Mako shark on each dive. 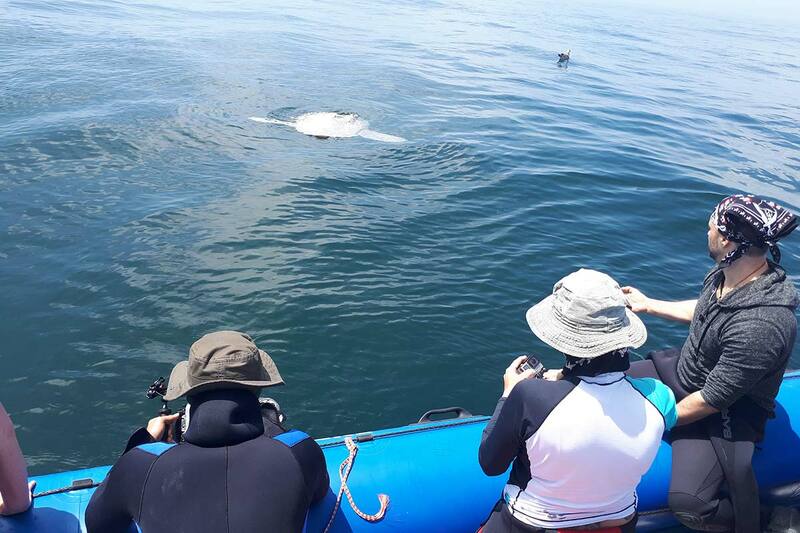 It was a super successful day with very happy divers seeing both species of shark we set out to find! Happy days! The ‘’Deep” as we call it is such a magical place offshore and when we head out there its always an adventure of what we could possibly encounter other than the Blue and Mako Sharks that we are searching for. Join us for one of these epic trips for an experience of a lifetime.